Can you name the official state fossil of Nevada? It’s the ichthyosaur, a behemoth that was 50 feet long and ruled the seas hundreds of millions of years ago. Some of the largest ichthyosaur fossils in the world were found in Nevada, but just recently, a new scientific controversy has emerged about how these giant reptiles got around. This might sound like an odd topic for the I-Team. However, few people in Southern Nevada seem to know it, but there’s a state park devoted to the ichthyosaur. It’s in central Nevada in what used to be a mining camp called Berlin. That’s where scientists found the remains of nearly 40 different ichthyosaurs. They plowed through the ocean above what is now Nevada, but back then, this land mass was down by the equator. Read the complete story at LasVegasNow.com. CARSON CITY, Nev.–The Nevada Division of State Parks will hold a public hearing on December 13, 2007 from 4:00 p.m. through 6:00 p.m., at 901 South Stewart Street, Suite 5005. The purpose of the hearing is to receive public comments regarding the amendment of regulations that pertain to Chapter 407 of the Nevada Administrative Code. The purpose for the amendment of these regulations is to provide for the equitable collection of reasonable user fees and to provide for operation and management of State Parks. CARSON CITY, Nev.–Governor Jim Gibbons signed a memorandum of understanding (MOU) with the governors of Idaho, Utah, and Wyoming to outline and formulate a cooperative plan to ensure the continued coordinated support efforts for wildland fire fuels management and rehabilitation efforts between all four states. 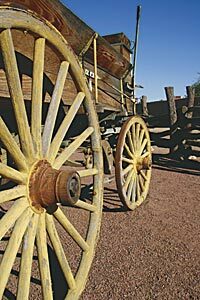 LAS VEGAS–History comes alive at the Old Mormon Fort State Historic Park when the gates open for the annual Pioneer Christmas Celebration on December 14 and 15 from 7:00 p.m. through 9:00 p.m.
Take a step back in time and discover the pioneer era with live music, Christmas carols, aromas of authentic Dutch oven cooking and a Christmas story as pioneer children hang their stockings. An 1860s Christmas will be re-created as close to the time period as one can imagine, with Civil War soldiers welcoming a wagon train into the Old Fort. This nostalgic experience for adults and children is free to the public. CARSON CITY, Nev.—The Nevada Department of Conservation and Natural Resources has identified new administrators for the department’s Division of State Lands and Natural Heritage Program upon the upcoming retirement of two long-time administrators. CARSON CITY, Nev.—The Nevada Division of State Parks announced today that there are federal funds available for local park and recreation capital improvement and acquisition projects through the Land and Water Conservation Fund. Counties, cities, unincorporated towns, general improvement districts and Native American tribes are potentially eligible for the 50:50 matching grants offered through the program. This National Park Service grant program is administered for Nevada by the State Parks division. Projects are being solicited for the 2007 and 2008 fiscal years. Near the start of the 20th century, the Lahontan Reservoir was looked upon as the way to transform the dry Nevada landscape into a paradise. Lahontan’s story begins in 1889, when the United States Geological Survey conducted several studies to determine the practicality of irrigating large portions of the American West. One of the regions considered was Western Nevada, near the location of modern-day Fallon. Read the complete story at the Backyard Traveler by Rich Moreno. You are currently browsing the Nevada Dept. of Conservation & Natural Resources News blog archives for November, 2007.